Well, Madame Moore is screeching like a barn owl on a hot summer’s night over conservative Supreme Court Justice, David Prosser, gaining close to 8,000 votes during the recounting of ballots in Wisconsin. The additional ballots seem to give Prosser the big win. Here are some of Madame Moore’s screets on Twitter, compliments of Big Hollywood. What a great way to end a Thursday! 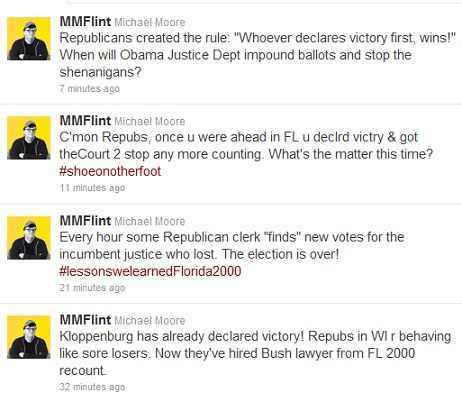 This entry was posted in Political/Social and tagged David Prosser, Michael Moore, Supreme Court Justice, Twitter, Wisconsin. Bookmark the permalink. 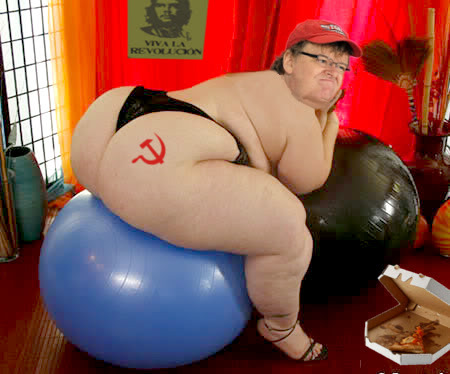 Prosser wins big time.MR Moore is a shill for stupidly, making all his money from capitalism,then mocking it.He in fact has no education, and made millions from our great country.In all other country’s he would be put in labor camps, or he would be flipping burgers. His useless dribble is laughable, states no real facts about anything,take talking points from msnbc,now that’s funny. I think he turns off some liberals as well. He’s a useful idiot buffoon. Now if we can just get the union thugs to head for….Canada, maybe? Solidarity, eh!